I first became aware of a values-based approach to communication and the ‘Common Cause’ work through the network that is now Learning for Sustainability Scotland. This approach really resonated with me as I followed National level political discussions about the value of culture and heritage in both Westminster and Holyrood. These discussions reflect similar ones in the field of sustainable development around ‘ecosystem services’ – we have all seen the headlines – “Culture is worth £x-million to the Scottish/UK economy” or “ecosystems services are work £x-million”. I have myself produced reports and applications that state a business case for a project in financial terms, but it has always made me feel a little bit awkward. I have always had a gut feeling that reducing culture or the environment to economics in some way takes away from the most fundamental reasons why we should be valuing these things in their own right. Finally, in Common Cause, I encountered a theoretical framework to describe exactly why I felt that the economic argument, rather than helping the case, can be hindering it. “Common Cause” is an approach that looks at how humans use values to guide our behaviour, how values are influenced by communications and society and how working with a values‐based approach can assist organisations with their communication and interpretation. Research has shown that the values that people hold are remarkably consistent across cultures and societies. Research also shows that these values can be classified into ‘Intrinsic’ and ‘Extrinsic’ values. “Intrinsic” values are inherently rewarding to pursue and are strongly associated with behaviours that benefit the environment and society, while “extrinsic” values are centred on external approval or reward and tend to make people more self‐interested. Experiments have found that values can be temporarily ‘engaged’, making people more likely to act on them and when one value is engaged, we are likely to suppress opposing values, making them appear less important (this is known as the ‘opposition effect’). Therefore, by emphasising how much money a particular behaviour might save an individual, one is actively working against the intrinsic value of appreciating nature for its own sake. Likewise, emphasising how culture makes money through tourism, acts against the intrinsic value of appreciating culture for its own sake and emotional wellbeing through connection with heritage. What does this mean for site Interpretation? This approach, arising from the work of psychologists and developed by communications experts at leading charities, has a lot in common with some of the tools and techniques we use in interpretation. When we interpret, we aim to provoke an emotional connection with the visitor and to enable them to make their own meanings from the information and experience we offer them. Consistent interpretation and communications for any organisation must begin with the organisation’s Mission and Values. From that point we can identify key messages for communication. 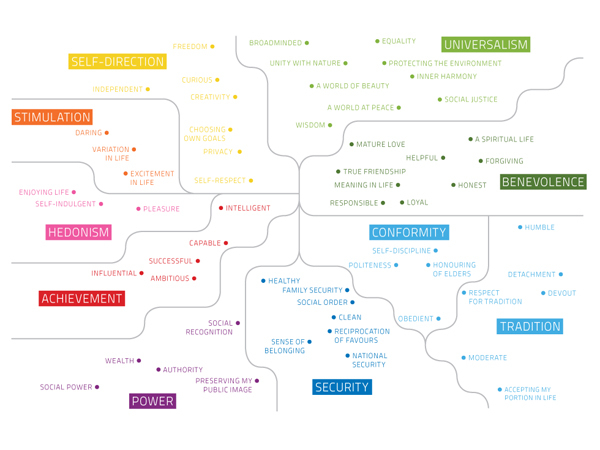 Values are a ubiquitous presence in advertising, media, politics, and third sector campaigns. For me, knowledge of the work leading to the ‘Common Cause’ handbook about how intrinsic and extrinsic values can work is a valuable addition to the interpreters toolkit. By taking care to avoid the ‘opposition effect’ within our interpretation for any given site we can ensure that we are supporting and reinforcing the values we want to communicate rather than unintentionally undermining them. 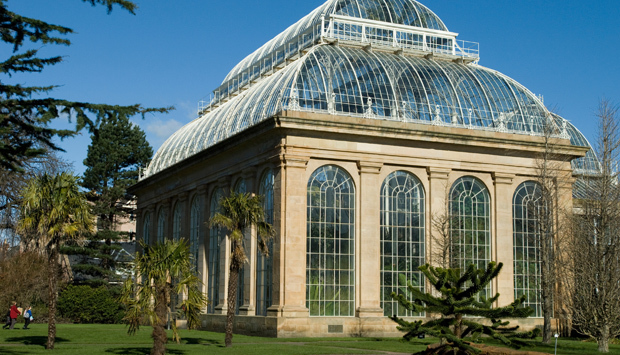 One of the clients I put this approach into practice with this year was the Royal Botanic Garden, Edinburgh. I was employed by the Garden to work with staff on an Interpretation Strategy and used this opportunity to explore with staff what they felt the Values of the organisation might be and how these might be communicated to visitors. The workshops we held to try to choose key values were lively, stimulating, challenging and enormously good fun. Staff from widely differing backgrounds and professions came together and explored the many facets of the organisation and its role in the 21st Century. 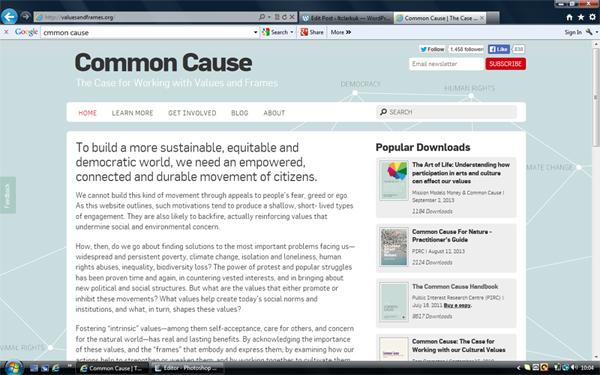 I would urge any organisation or interpreter to read the Common Cause handbook and think about how it might apply to your work.